Join us at the Arkansas Environmental Federation’s Annual Air Seminar to learn more about air regulation. We are pleased to once again sponsor this event. This is one of the nation’s premier air seminars which includes a long list of knowledgable speakers who bring pertinent information related to air regulations, testing and monitoring. This is a must-attend event in order to stay on top of rapidly changing air regulations. Need help with your air regulation? See our testing capabilities. We look forward to seeing you in Little Rock, AR! 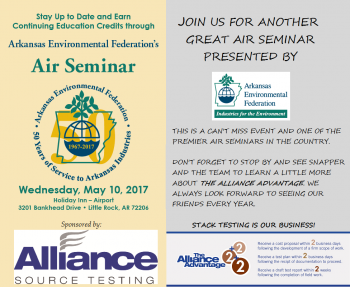 The Arkansas Environmental Federation’s Annual Air Seminar was organized by the Air Committee. The Air Committee works to keep our members informed about issues such as ozone, particulate matter, air emissions standards, greenhouse gas reporting, MACT standards, permitting, inspections and enforcement initiatives. The Committee also plans and conducts an annual Air Regulations Update Seminar and an Air segment in the AEF’s Annual Convention & Trade Show designed to educate industries on their obligations in air pollution control. The Committee meets at the call of the Chair and is open to all AEF members in good standing. Member companies may have more than one representative on the Air Committee. Learn more about continuing education opportunities from the AEF.